The story involves Marion Cotillard having a "weekend to see colleagues and convince them to give up their bonus so she can keep her job." 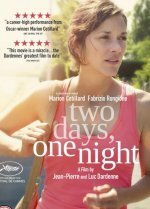 Two Days, One Night release date was Wednesday, December 24, 2014. This was a Limited in theaters release.